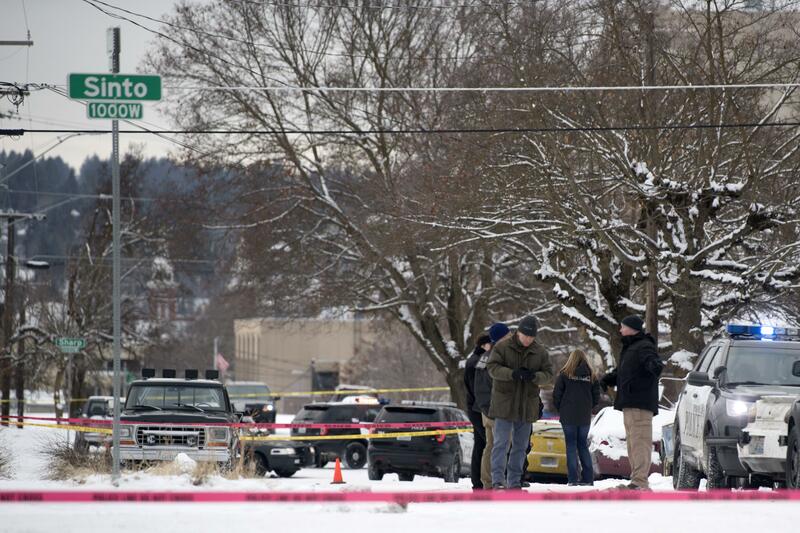 UPDATED: Mon., March 26, 2018, 10:48 p.m.
A Spokane police officer who killed a robbery suspect in December was justified in using deadly force, the Spokane County Prosecutor’s Office said Monday. The shooting occurred Dec. 26 when Officer Chris LeQuire attempted to arrest Joshua P. Spottedhorse. The 36-year-old Spottedhorse was suspected of robbing the Safeway store at 1616 Northwest Blvd. and firing a gun in the store’s parking lot. Now that prosecutors have forwarded their findings and elected not to charge the officer, an internal affairs investigation will begin, police Chief Craig Meidl said Monday. In a news release sent Monday, prosecutors provided the first look into what happened during the moments leading up to the shooting near Sharp Avenue and Madison Street. According to the news release, a video surveillance camera at the store showed Spottedhorse robbing a female store clerk at gunpoint. His vehicle was tracked to 1420 N. Jefferson St. Prosecutors say Spottedhorse then abruptly stopped, spun around and “faced squarely at SPD Officer Chris LeQuire, who was within approximately 10 feet” of the suspect. Spottedhorse placed his hand inside the front of his pants at the waistband area. Spottedhorse was pronounced dead at the scene. During their investigation, police found a 9mm shell casing in the Safeway parking lot that was apparently ejected when witnesses said the robbery suspect fired his gun into the air after stealing cash from the store. A 9mm semi-automatic handgun was found at the residence on Jefferson Street where Spottedhorse left the car, prosecutors said. Spottedhorse was not armed when he was shot. Police were wearing body cameras at the time of the shooting. LeQuire, who has been with Spokane Police Department for nearly five years, was involved in a fatal officer-involved shooting in April 2016 when a homeless man, Mark Kurtz, approached him with a knife, yelling “Kill me!” outside the House of Charity. LeQuire could be seen and heard on multiple body cameras reasoning with the man in that case, saying that he wanted to help him before firing his Taser. It failed, which is when another officer shot and killed Kurtz. The shooting made national news and recently prompted police Ombudsman Bart Logue and Meidl to discuss sweeping changes to training within the department that could help curb future officer-involved shootings. Published: March 26, 2018, 6:51 p.m. Updated: March 26, 2018, 10:48 p.m.